Dana White is back with his Day 1 video blog for UFC 129. Video includes Chuck Liddell's "biased opinion" on the GSP vs. Jake Shields fight, as well as some UFC office hijinks. GSP is one strong mofo. We showed you a video of him doing a feat of strength on the rings, and now we've got one showing him doing a "hover" maneuver. This guy is so strong that he must dominate everyone on Festivus. All we need now is a video of him on the uneven parallel bars. Here's the hover vid, plus a video of him doing some more traditional sparring in preparation for next week's title defense against Jake Shields. Some 16 year old kid had a beef with another teen over a girl and it came to blows. Ok, that happens, nothing new there. But what makes this story is different is that the dad of the 16 year old, a Florida man named Philip Struthers, age 41, apparently arranged the fight and can be seen on the following video egging his son on. The fight took place on concrete and the dad was yelling words of encouragement such as "Punch his eyes out! Slam his head on the ground!" Gee, what a sweet childhood memory it would have been if the kid took his dad's advice and put the other kid into a coma. Or better yet, killed him. Unfortunately, no one was seriously injured in the fight and presumably the son was grounded for his inability to finish his opponent. Wow, this is the best post-fight video ever. Of all time. Amazing stuff. How this guy is not working for the UFC is beyond. Damn, he's good. Dana White was as enthralled as everyone else during the one round slugfest between Nick Diaz and Paul Daley on Saturday night. The fight was a great see-saw battle that saw both men hurt. Near the end of the round, however, it was Diaz who knocked down Daley and finished him with a barrage on punches on the ground. 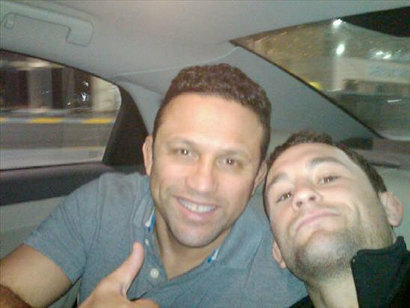 Daley was booted from the UFC by Dana last year after his infamous sucker punch of Josh Koscheck at UFC 113. And Dana made it clear before the Diaz fight that he was rooting for the 209 and Nick Diaz. I give him all the respect in the world for that fight. They went to war! Will that be enough to get Daley back into the UFC? I have my doubts about that, but it's a good start. Never say never! Here's a post fight interview with Daley from Fight Hub. The big Strikeforce Diaz vs. Daley event is tomorrow night and the fighters already have their game faces on. Here's a video from the final press conference ahead of tonight's weigh ins. Just a few days away from the highly (pardon the Diaz pun) anticipated Strikeforce title fight between champion Nick Diaz and Paul "Semtex" Daley. The smack talk surprisingly did not reach crazy levels, and it's probably due to a grudging respect each man has for the other's skills. Should be a fantastic match on Saturday. Check out this preview video. UFC 129 is just around the corner, and the fighters are in the final phase of training. Topping the card is the welterweight title fight featuring champion Georges St. Pierre vs. Jake Shields. This is a match that has grappling fans buzzing, because both men are great on the ground. The big question for Shields is can he get the fight there. On April 30th, that question and others will be answered. In the meantime, enjoy these pre-fight interviews with Shields and GSP.